This is roughly a 3,000-foot climb (in less than 5 miles, so it is very steep) from the shore of Lake Louise to the top of Mount St. Piran, one of two relatively easy scrambles on either shore of Lake Louise. On the south shore is Fairview Mountain, which I climbed three years ago. On the north shore is Mount St. Piran, which I had twice tried to climb before but got pushed down by horrendous weather. Last year, I tried to climb it, winds at the top were at least 50 to 60 miles an hour and thunder and lightning were crashing through the whole Lake Louise basin. I figured if exposure didn’t get me, the lightning would and had to turn back. This latest trip didn’t appear particularly promising, either. Upon arrival, it was cold, rainy and when the top of Mount St. Piran did appear every once in a great while through breaks in the dark clouds, you could see a dusting of snow on top. There wasn’t much to do at all that whole day because the weather was so crummy other than drive down to Banff and catch a matinee of the new Batman movie. The weather tends to be crummy at Lake Louise quite a bit because of both its elevation — 5,700 feet — and a notch in the Continental Divide just west of the lake that tends to funnel a lot of weather systems right through that area. I’ve seen beautiful weather in Canmore and Radium Hot Springs, but then the weather all goes to hell as soon as you get to Lake Louise. You really have to pick your spots with the weather here and take advantage when you can. The next day, dawn broke without a cloud in the sky and I realized this was my chance — FINALLY. One good thing about an early start. This is a very busy area of Banff, with visitors from all around the world converging on Lake Louise. The trail gets very, very crowded by mid-morning, especially on the section between Lake Louise and the Lake Agnes teahouse. I found that if you start at 7:30 a.m., you will miss the crowds. Not a single other person was on the trail on the way up. You take the trail to the famous Lake Agnes teahouse, which is where most hikers stop. Some go to the Little Beehive or even the Big Beehive, but only a handful make the little-known trek up to Mount St. Piran. All of the trail signs around the area do not show a trail to the top of this mountain; I only heard about it by reading some guide to scrambles in the Canadian Rockies. To get to the St. Piran route, you take the trail from the Lake Agnes teahouse east to the Little Beehive (the more spectacular Big Beehive lies west). About two-thirds of the way to the Little Beehive, perhaps 500 meters from Lake Agnes, is a nondescript sign for the Mount St. Piran trail. Mount St. Piran has actually been scratched off the sign. I knew this had to be the trail, but it still gave me a bit of misgiving that the name was scratched off. Was that a message not to head up the trail? Maybe it had washed out. The trail switchbacks several times up the steep slope of Mount St. Piran, and you get ever more spectacular views of Lake Louise, the Big Beehive, the Fairmont Chateau and Fairview Mountain to the south of the lake. At this point, clouds began rolling in, but I was still counting my lucky stars that any sort of actual weather was holding off. Finally, you reach a saddle between two subpeaks. It’s a quick, easy walk to the lower subpeak, which gives you some fantastic views of the Bow Valley nearly 4,000 feet below. I was slightly spooked by the route to the upper peak. As you hike up the switchbacks, the two peaks appear to be of a similar elevation, but as you get to the lower summit, you realize the upper summit is still another two hundred to three hundred feet higher. And the trail appears to peter out in the rocks and boulders pretty quickly. I talked myself into trying it, not really feeling I was prepared for a scramble of 200 to 300 vertical feet over boulders with some fairly intimidating-looking exposure. But, it turns out there continues to be a very steep, primitive trail twisting back and forth through the rocks. It’s just plain invisible from below. There is one slightly spooky spot where you make a 90-degree turn on a pitch with extreme exposure 4,000 feet straight down to the north, but other than that, it wasn’t difficult at all. Mount St. Piran in every book I’ve read about it is classified as a “scramble,” but frankly, I wouldn’t call it a scramble, with a primitive trail going most of the way to the top. The trail eventually does vanish, but at that point, you are probably less than 50 feet below the summit and it’s an easy horizontal walk through boulders on the wide and round summit. Up at the top, you have to walk to the edge of the domed summit to get views of Lake Louise and the Fairmont Chateau. 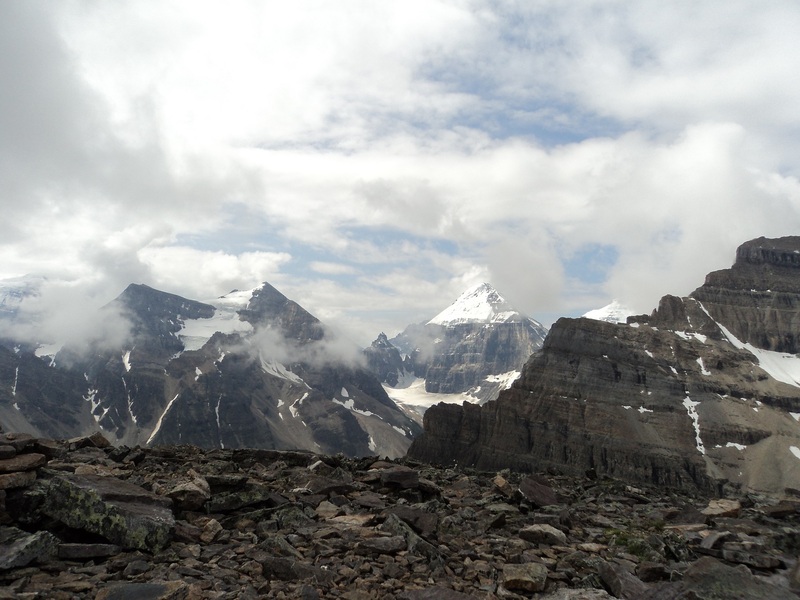 You do get some spectacular views from the top of 9,000- and 10,000-foot peaks — Fairview Mountain, Mount Victoria, Mount Lefroy, Mount Aberdeen, and The Mitre. There is also a pair of massive glaciers, Victoria and Lefroy, that you look down on. In an hour at the summit, the weather continued to hold (it did go all to pieces late in the afternoon), and the sun briefly made an appearance. There is also wildlife up there. A pair squirrels scurried through the rocks, eating wildflowers and I saw two hoary marmots near the top. The mountain gets a little busier in the afternoon — about a dozen people were slogging their way up the side of the mountain after noon . The Lake Agnes teahouse is a great place to stop for lunch after all your hard work. The bread is all homemade and they make a mean tuna salad sandwich. On the way down from Lake Agnes, you realize how important it is to get an early start if you want to enjoy a “wilderness” experience. There were hundreds of hikers going both up and down the Lake Agnes trail, speaking languages from around the globe (It is funny to see European visitors hiking up to Lake Agnes, a not-to-be-taken-lightly 1,400-foot elevation gain, in dress flats and Italian loafers. ).